Extensions introduced in Castle Game Engine related to shapes. See also documentaton of supported nodes of the Shape component and X3D specification of the Shape component. The field render allows to easily hide and show the given Shape. A hidden shape is not rendered, but otherwise it's still processed (for example, it is used for collision detection). If you want to hide a particular shape, sometimes this may be a simpler method than using standard X3D Switch node. It doesn't require to wrap the Shape in a Switch node. This is compatible with InstantReality Shape extension. DEFAULT: use the default shading. In view3dscene you control this using the "View -> Phong Shading on Everything" checkbox. In your own games you control this using the Scene.Attributes.PhongShading property in Pascal code. GOURAUD: fast per-vertex lighting calculation. It is the default shading for now. Explicitly specifying the "GOURAUD" indicates that this shape wants to use Gouraud shading, even if the default scene shading is Phong. Note that some features (like bump mapping and shadow maps) will override this and require Phong shading anyway, since it's impossible to realize them with Gouraud shading. Note that the "GOURAUD" shading performs only one-sided lighting in the shader pipeline. This means that only one face side receives lighting. By default (when ccw="TRUE") this is the side oriented in a counter-clockwise fashion, but you can switch this by setting the ccw="FALSE". The other face will be always black (or invisible, if the backface-culling if used, by solid="TRUE", which is actually default). PHONG: pretty per-pixel lighting calculation. This also means always using shader pipeline to render this shape. This also performs two-sided lighting. WIREFFRAME: render as a wireframe. The rendering model matches the IndexedLineSet specification, in particular: the shape is not lit. For now this is only honored by the Box, Sphere nodes. It will be extended to all geometry nodes when necessary in the future. These shading names are consistent with "Browser options" in X3D spec (with DEFAULT added by us). We add a new field to the Appearance node to request a specific alpha treatment when rendering. SFString               alphaChannel  "AUTO"      # "AUTO", "NONE", "TEST" or "BLENDING"
Test file of this feature. Value AUTO (the default) means that we auto-detect the correct alpha treatment, looking at various things. 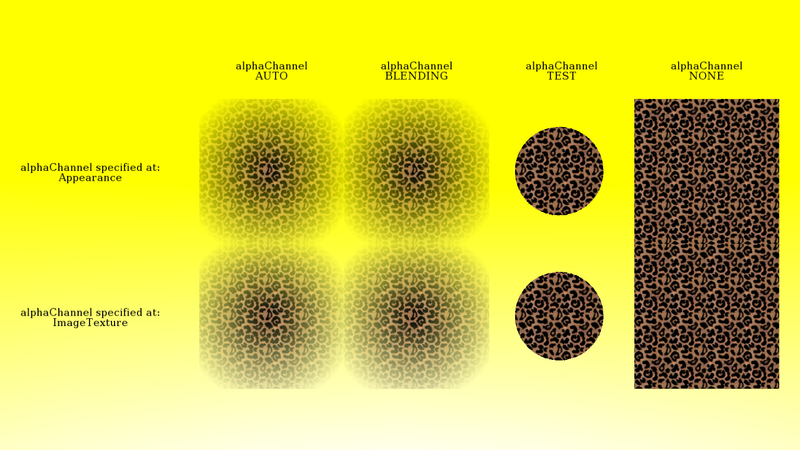 texture properties (whether some texture defines some alpha channel, and whether it's a yes-or-no alpha channel or smooth). The interpretation of each texture may also be affected by it's ImageTexture.alphaChannel field. NONE: Ignore any alpha channel, render as opaque. TEST: Use alpha-testing, which is good for textures having a sharp (yes-or-no) alpha channel contents. BLENDING: Use blending, which allows to show partial transparency of textures and/or materials.